JAZMYNE ANDERSON TTN FILE PHOTO Sophomore epee fencer Chantal Montrose (left) and senior foil fencer Alyssa Lomuscio prepare to attack their opponent during last year’s Temple Open at McGonigle Hall. The Owls nearly swept all three weapons at the tournament, while Montrose placed second and Lomuscio tied for fifth. The fencing team will begin its season at the 32nd Temple Open. The fencing team is preparing to begin its season at the 32nd annual Temple Open, which will mark the beginning of its new schedule to feature matchups with eight of the Top 10 teams in the country. Coach Nikki Franke, who is entering her 40th season, said this year’s team has depth across the weapon events and is looking forward to the competitive meets. The Owls will look to make another run for the NCAA Championships after placing ninth in March. “Our veteran experience is really going to be key this year,” Franke added. The Temple Open, hosted in McGonigle Hall, is known as the largest individual tournament in the country with more than 600 entries from about 30 different schools. The tournament begins with women’s events on Saturday and men’s events on Sunday. During the tournament, the fencers will start in pools and then 80 percent of the competitors make their way to a second pool before an elimination round. The top eight fencers at the Temple Open will compete for the gold medal in a final round. 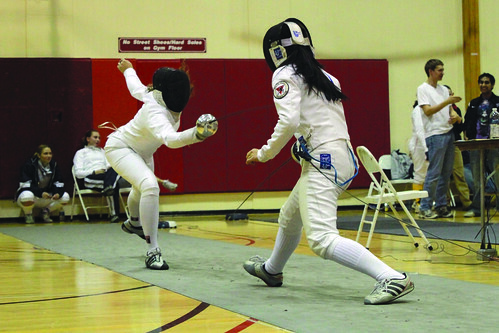 Last year, then-freshman Epiphany Georges won the foil event and then-senior Audrey Barroso won the sabre event. Ten fencers return for the Owls this year across three weapon events. Last season, every fencer on the roster qualified for the NCAA Regional Championships, which was a goal the team set for itself. Playing as a team is important to Franke and she said that the goal is to have the whole team qualify for regionals again this year. “We do a lot of subbing in and out and we don’t lose very much when we do that,” Franke added. The foil squad is the Owls’ deepest event, as they return every fencer from the previous season. Franke said she “expects a lot” from that squad due to their experience. Senior Alyssa Lomuscio made Second Team All-American last year at the NCAA National Championship taking seventh place in the foil event and will be the foil squad leader. “Especially during the team meets we’re going to be able to give each other advice and work off of what we already know,” Lomuscio added. This season will again consist of a young sabre squad since two of the team’s returners in the event are sophomores and the remaining half is made up of freshmen. Senior team captain Kamali Thompson, who is a three-time NCAA qualifier will be expected to lead the sabre squad. Thompson finished 15th in the sabre event at last season’s national championships. The epee squad is also a young squad after losing two seniors, Alyssa Lombardi and Grace Wu. Sophomore Chantal Montrose is the squad leader of epee and will look to use her experience as a NCAA qualifier to help lead the team. The Owls’ next individual meet after the Temple Open is the Penn State Open on Nov. 11. The Cherry and White will compete in its first team match on Dec. 3 at the Penn State Invitational. The No. 9 Temple fencing team placed ninth at the NCAA Championships in Boston last week.